With increased demands for individual mobility, and with more people moving in to the big cities, the need for an efficient, but environmentally friendly urban transportation solution is needed. You could of course buy a bicycle, a solution that has been available even longer then cars. A regular bike will take you where you want to go in your local area at zero carbon emission, and at the same time it gives you exercise. Yet today a lot of people still have a tendency to take the car, even for going to the local shop a 10 min walking distance down the road. BMW Motorrad has seen the signs of the times and is expanding its business activities to include the facet of urban mobility. The first stage of development was an e-scooter concept vehicle presented at the BMW Motorrad Innovation Day 2011. 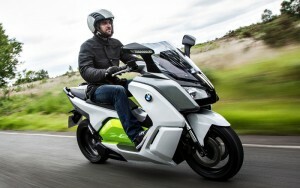 Shortly after this, the corresponding design study of an e-scooter saw its premiere, the BMW Concept e. The latter embodies the aesthetic vision of an electrically powered scooter. On July 27th 2012 in London, BMW Motorrad presented the highly promising third stage of development. The near-production ready prototype of an e-scooter that might soon become part of everyday road traffic in cities throughout the world, the BMW C evolution. The prototype scooter has great performance and functionality, packaged in a beautiful design. It comes with 11 kW continuous output and 35 kW peak output, which gives the BMW C evolution a powerful and speedy ride experience. With impressive acceleration, and a top speed of 120 km/h (75 mph), it easily stands up to comparison with current maxi scooters with a capacity of 600 cc or more. It handles great both in high and low speeds, and even with a passenger, and this is made possible by it’s low center of gravity. Provided is also a high-performance brake system with ABS, to ensure maximum safety. The key factor in an e-scooter is of course it’s range. The C evolution has a range of up to 100 kilometers (62 miles), thanks to the storage capacity of it’s high-voltage battery of 8 kWh. When the battery is completely flat, charging time ideally lasts less than three hours. The battery is charged via the integrated charging device, either through a regular household socket or at a charging station. A pioneering solution in terms of energy regeneration, so called recuperation is also provided. The vehicle recuperates automatically whenever possible, either via engine drag torque in trailing throttle or during braking. This feature increases the range of the e-scooter by 10 to 20 per cent, depending on riding style. With increased fuels prices and with and global focus on building more environment friendly solutions, in recent years even the major car manufacturers have woken up to the change of times. BMW has worked for years to develop solutions that not only lower fuels consumption, but also keep improving the performance and overall driving experience. Something consumers expect and are used to from a high quality German sports car. It’s nice to see that BMW is not only pushing its environmental vision on high performance cars, but also on less expensive personal urban transportation methods. BMW has proved more then once that you don’t have to drive a slow and boring, under powered car, to be green. If the BMW C evolution moves from prototype to a production vehicle, the same might become true for the more individual, and cheaper transportation methods like a scooter.